TBD-Date/Time/Location will be sent via email reply. In an effort to better streamline our scheduling, Hodson Golf will be implementing our new reservation system (which is currently being tested). Due to winter conditions Hodson Golf will only be scheduling 2 weeks out. If you desire a future date/time that is not listed here please contact us so that we can tentatively get you on the books. We encourage everyone interested in a fitting to schedule early, as last spring we were booked nearly 4 weeks out. We currently have all the latest and greatest 2017 equipment (and in some cases not yet released clubs) available for your private fitting. Range balls are provided and we encourage everyone to arrive a few minutes early to warm up (especially this time of year). We do add time between each session so that no one should feel rushed. We have a full locker room with showers at both locations if you need to change or clean up before/after. The fitting process is thorough and utilizes all the modern state-of-the-art tools including Doppler Radar launch monitors. Please refer to our website for more detailed information regarding our fitting and experience. As with last year, we are fitting for all the major O.E.M. brands (except Taylor Made) which include (but not limited to): Callaway, Cobra, EvnRoll, Miura, Mizuno, Ping, PXG, Scotty Cameron, Srixon, XXIO, Vokey, and Titleist. Sorry but if your looking for an M1 or M2 driver fitting we would encourage you to go to your local big box – they have thousands of them. Each 45 minute private fitting session costs $150 (keep reading though!) which will cover a specific individual fitting (i.e iron fitting only, wedge fitting only, putter fitting only, hybrid/fairway fitting only, driver fitting only). If you are in need of multiple fittings (i.e. a full bag fitting) then please let us know when we contact you after your fitting session purchase, so that we can allocate additional time to cover your extended session. We will then send you a revised invoice for the necessary time to cover your extended fitting session. After your fitting reservation purchase, we will contact you to get more information regarding your desired fitting type. We will also send you a questionnaire for you to complete which will help us be better prepared for your private fitting. As always, a portion of the fitting fee will be applied to all purchases depending upon purchase amount. In some cases the entire fitting fee is credited to the purchase price (for example a full PXG iron set). As always, the fitting fee includes a limited complimentary “follow up” fitting once you have had a chance to “break in” the new equipment at which time any “tweaks” or adjustments can be made if needed. To book your time simply purchase a ticket and you will be directed to Paypal to complete the transaction. Once you are directed to the paypal website you can simply log-in to pay or if you do not use paypal you will see an option on the lower portion of the paypal website to use your credit or debit card. Once purchased, we both will be issued a receipt from Paypal via email. Hodson Golf will then contact you directly to confirm and block out your desired session and will also provide you directions and a questionnaire via email. Due to current and anticipated spring demand, Hodson Golf is only fitting for custom fit/made clubs purchased directly from Hodson Golf. 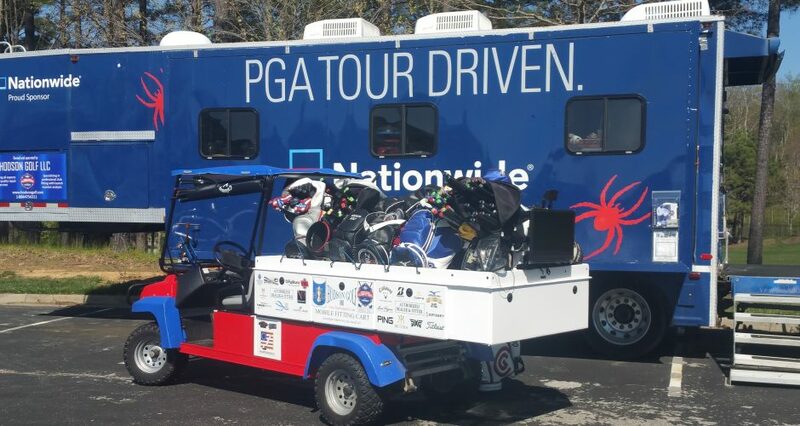 Hodson Golf also operates 2 tour trailers so please let us know if you need any tour-level repair/re-gripping done during your visit with us. We encourage everyone to arrive a few minutes early to warm up (especially this time of year). If we have received a large amount of rain (or snow) the day/days prior to your scheduled fitting there is a strong change that one or both of our facilities may be closed. If this is the case we will contact you directly to re-schedule. Due to current and anticipated Spring Demand, those who have registered and paid for their fitting session/sessions will be given priority. This pre-pay priority status will also be applied in case of rescheduling. For those travelling extended distances we do offer lodging at our cottage’s at Independence Golf Course. This facility feature all the amenities you could imagine in addition to a championship golf course, 9 hole short course, and the regions top practice facility at your doorstep. Please contact us directly if you are interested in staying here during your visit, as we do offer a stay/fit/play package. Our winter facility features an indoor/outdoor hitting bay in addition to covered outdoor bays. We do have heat but if its very cold and/or windy its not much fun. If this is the case we would probably re-schedule and we will contact you directly with your re-schedule day/time given priority. If you have any questions or concerns please contact us directly or feel free to call (leave a message if we don’t answer) at 804-475-6311.